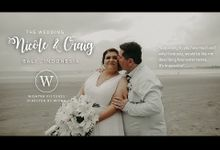 We had an Indian wedding in Bali on the 4th of March and Wishtra Pict was our videographer for all the events. These guys were amazing throughout the wedding and pre wedding events, they captured all the important moments, candid ones as well and made a beautiful highlight video. Additionally they are super funny and great to be with. They also deliver on time :) We would love to thank them for capturing our wedding and helping us hold on to wonderful memories of our big day. Thank you for a reviews Lakshmi & Vinay. We are so happy to be your videografer and Thank you very much for trusting us.... Have a good day Lakshmi & Vinay. Sudah banyak vendor yang saya sewa jasanya, tetapi yang ini sangat berbeda. Menyenangkan dan hasilnya sangat bagus, Good Job bro!!! Very Awesome!!! Thank you for trust us as your video vendor..